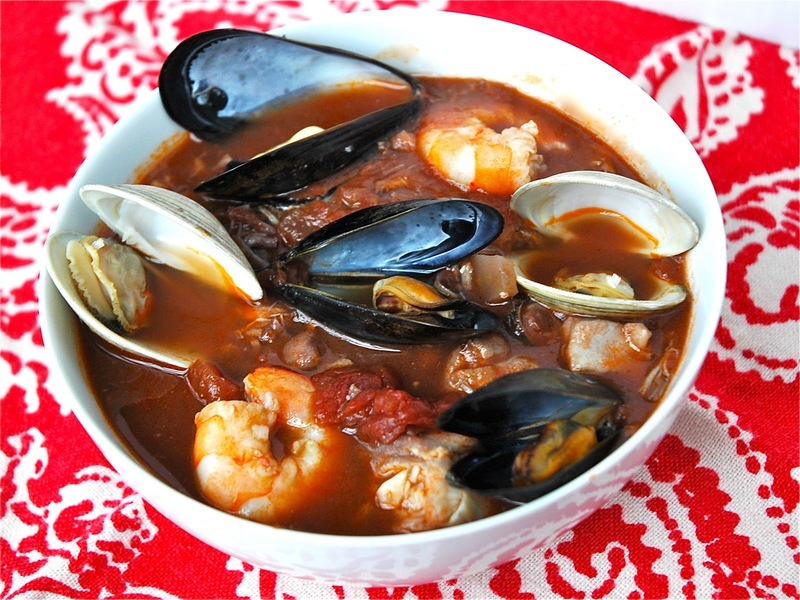 Cioppino is without a doubt my all-time favorite seafood recipe. And I love all things seafood. I guess because it's a wonderful warm stew that can be different each time you make it, depending on what seafood you decide to add. When you get this in a fancy restaurant it usually comes with clams and mussels, shrimps and sometimes lobster claws. This looks wonderful, but to be honest isn't exactly easy to eat. And not the sort of thing to order if you're out with someone you don't know all that well. I prefer to make it at home, and I make it without all the shells. 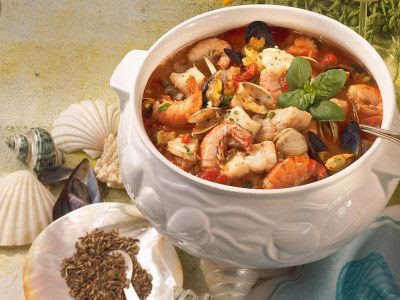 I have found mussels, clams and oysters frozen that are wonderful to add to this as well as shrimp, scallops and crab meat. And then again sometimes all I have is some sole fillets and that still makes a great stew. I think the secret is in the broth which can be made ahead and kept frozen. When you have this in your freezer and a few bags of seafood you can have this Paleo friendly meal in minutes, you can eat it every week, and you will never get bored. I speak from experience. First I make the broth, and I make it in my slow cooker. You can make it in a pot on the stove, I just find it easier to do it this way. I forget about it during the day, then in the evening it's ready to freeze. When I want a Cioppino meal I just thaw out a container of broth and add whatever seafood I happen to have, cook for a few minutes, and it's ready. 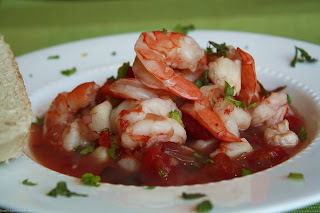 Because seafood cooks very quickly and in fact needs to be watched very carefully or it ends up like rubber, this is a great 15 minute meal - once you have the broth made that is. - To whatever pan you are using, add the tomatoes, chicken broth, spices, water and wine and mix well. - In a stock pot, cover and simmer for 30 minutes. In a slow cooker, cook on low heat for 4 hours. This makes a LOT of broth. I got 10 servings out of my last batch. Since you are adding seafood you don't need more than a cup per serving. 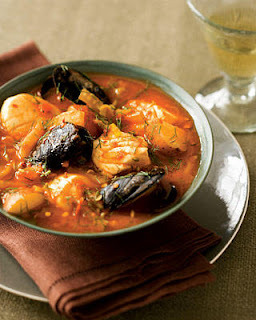 To make the actual Cioppino just add seafood to the broth and heat until the seafood is cooked. I have used sole fillets, shrimp, scallops, crab meat, oysters, lobster, clams, and mussels .... and I'm sure there are many more options. You can use one kind of seafood or many - it really doesn't matter. Each version will be delicious as you can see by the various illustrations. Add a green salad and a glass of wine and you will never miss eating out. (will freeze) Freeze broth only. 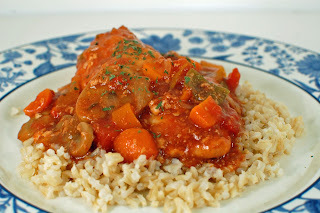 Another classic, Chicken Cacciatore is a great recipe to add to your Paleo slow cooker collection as well. 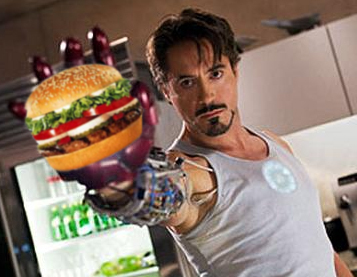 In either case, that green salad would still be the perfect accompaniment. - Put all the ingredients into your slow cooker, cover, and cook on low for 6 to 8 hours until the chicken is thoroughly cooked. I've always been partial to hunky Italians, and knowing I have a couple waiting for me at home, keeps me from being tempted to pick up tonight what I know I will regret in the morning.